NOW: For his repeat Jean Sherrard moved further south on the Delmar Drive overpass to get around the screen of trees that now shoulders the freeway. Both Jean and I confess to some disappointment that this week’s repeat did not quite give what we thought it would. 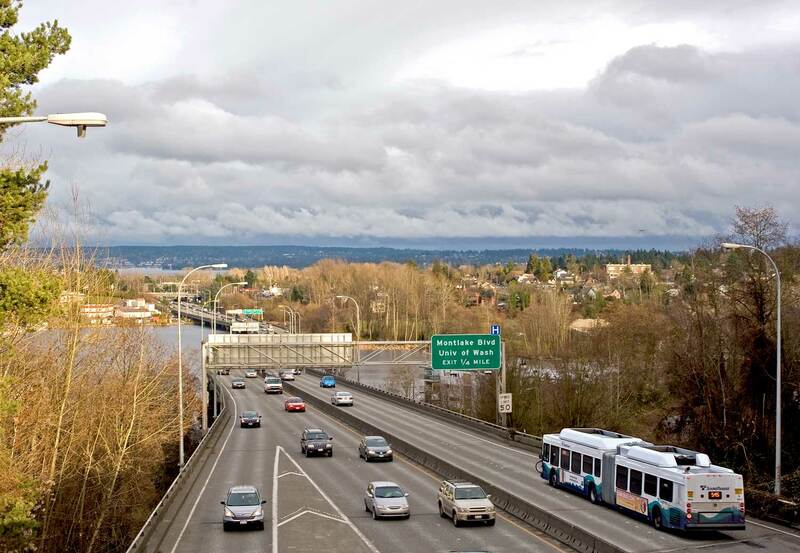 These views look east from the Delmar Drive E. overpass above Highway 520 where it makes its approach or withdrawal from the Evergreen Floating Bridge. 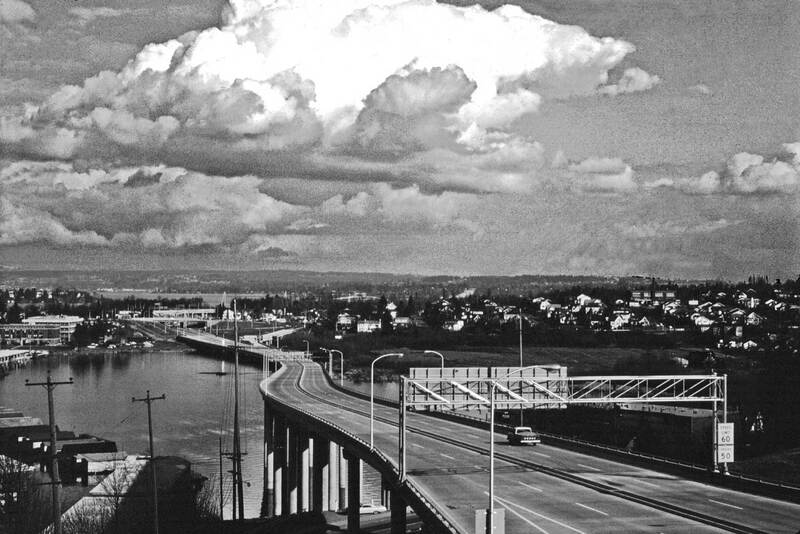 An enthusiastic amateur named Horace Sykes photographed the historical scene on the Monday afternoon of February 24, 1964, which was only a half-year after “the longest floating bridge in the world” first opened on August 28, 1963. Jean repeated it 45 years later to the day – on a Tuesday. For estimating when in the afternoon Sykes recorded his Kodachrome slide, Jean and I studied the shadows cast on the pavement from the sturdy post, far right, supporting the sign. Agreeing on an estimate – sometime between 4 and 4:30 pm – we smiled and rubbed our hands with satisfaction. We expected that the solitary pickup heading west in Sykes photo would by now be joined by a commuter pack hurrying home like bumper cars in a carnival. Harvey Pike actually tried to split his land in two with a simple pick, shovel and wheelbarrow. This, in the way of tools, was only a little more than Moses used to divide the Red Sea. But Harvey Pike had none of the divine aid, or in his case, federal subsidy, and so he had to give it up. 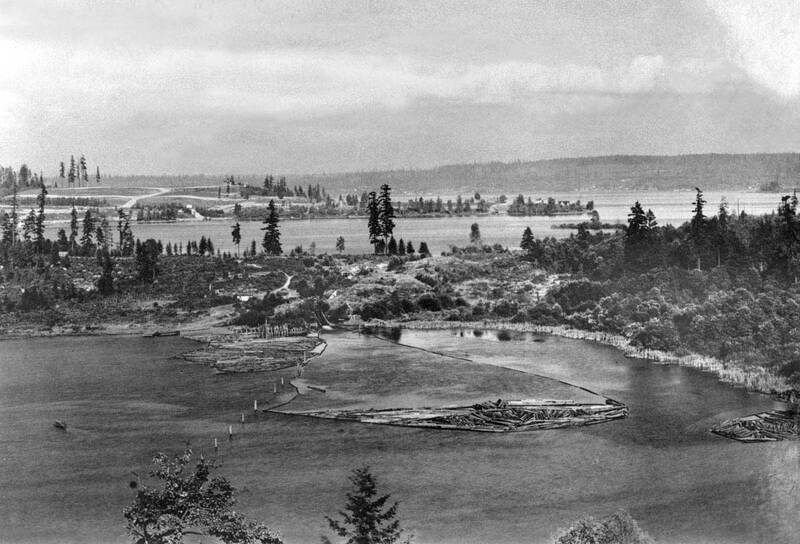 The subsidy wouldn’t come in large amounts until 1910 when a Rivers and Harbors Act passed by Congress included $2,750,000 for the construction of locks down at Shilshole, so long as King County agreed to finance and build the canal that would run from the locks to the “big lake,” and the county consented.